The windmill you see today was erected c1814 after a previous mill was demolished. It is said to be the largest post mill in the UK. The ancient village of Windmill Hill includes some of the highest ground for miles around and is ideal for a windmill location. The site overlooks the Pevensey Levels and the English Channel to the south, the general direction of the prevailing wind. 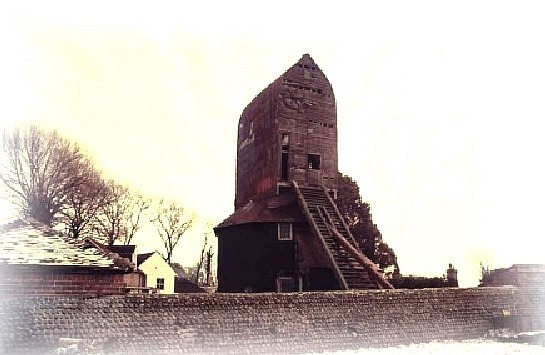 The Post Mill was built to a traditional Sussex design with the trestle enclosed by a brick Roundhouse complete with Tail-pole winding, powered by four Patent Sweeps. In the mid-1850’s, to overcome some local wind flow restrictions the trestle was raised on brick piers, with the Roundhouse height increased to suit, and in so doing it became one of the highest and largest Post Mills in the country. 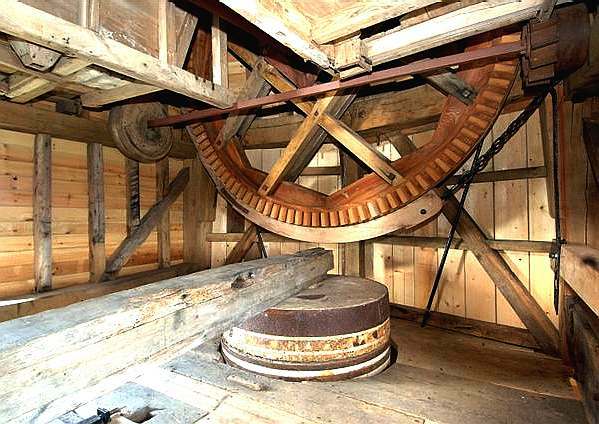 The windmill machinery included one pair of French Burr stones and one pair of Derbyshire Peak stones and was worked in this form as a corn mill. 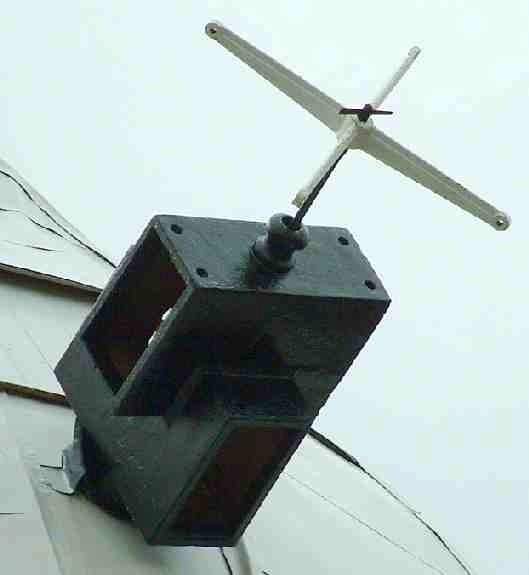 In 1876 a mechanical refinement in the form of a patent Hammond Sweep Governor was installed to provide a constant speed windmill for more control. By 1894 part of the wooden structure in the buck was found to have deteriorated. To avoid expensive repairs the then owner had the sweeps removed and in order to continue milling the Peak Stones were moved out of the buck to the trestle floor below to be powered by a coal-fired steam engine newly installed for this purpose. At the start of World War Two the mill had ceased working and changed hands a number of times. Little work was done to maintain the mill and it gradually slipped into a state of disrepair, so much so that by 1993 it was necessary to install steel supports to prevent the mill from falling over. RESTORED - In December 2001, the Heritage Lottery Fund contributed £577,000 towards the restoration of this iron clad behemoth. Unfortunately, the restoration is not that well documented. The Heritage Lottery Fund also paid several £million pounds toward the Pier at Hastings, and now that charity are in financial trouble, having gone into administration according to recent press coverage. In 1913 the mill ceased to mill corn, but was left as a landmark for shipping in the channel to use. The Mill was bought by Paul and Bee Frost in 1993, since then they have set up a charity to restore the mill. The works in progress photographs were taken in April 2005. 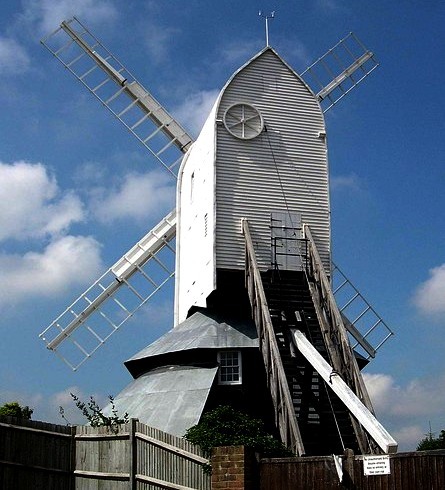 You'll find the mill on the A271 between Herstmonceux and Boreham Street. Very limited parking is available on site for one or two cars or small coaches. The mill is a Grade II* listed, dating from 1814. It is the second tallest and largest post mill in the United Kingdom. The mill last worked by wind in 1894 and has been authentically restored as a working mill. Visitors may access the mill body by climbing the long ladder at the back of the mill accompanied by a guide. The visitor centre in the roundhouse is accessible by wheelchair. There is a WC for the disabled and guide dogs are allowed. Opening Times 2017: Easter to October, Sundays and Bank Holiday Mondays 14.30-17.00. See their web site for more information. School parties and groups by prior arrangement throughout the year. Admission is by donation to help pay for ongoing maintenance. 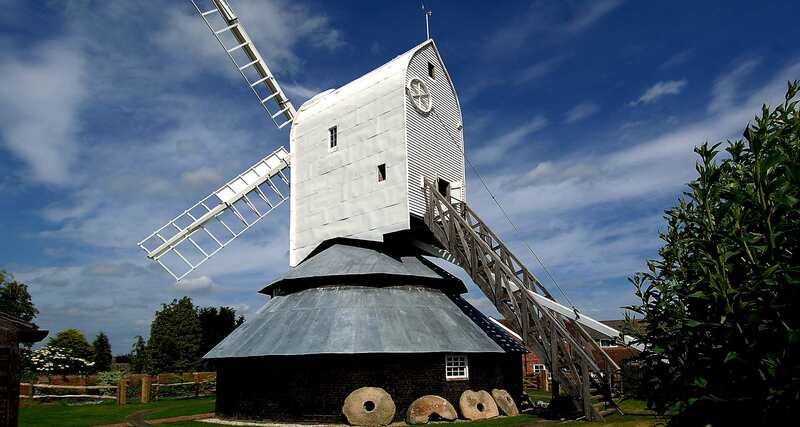 There is a film of the history, operation and restoration of the windmill and the milling machinery and a virtual tour for visitors who cannot climb the long ladder into the mill. 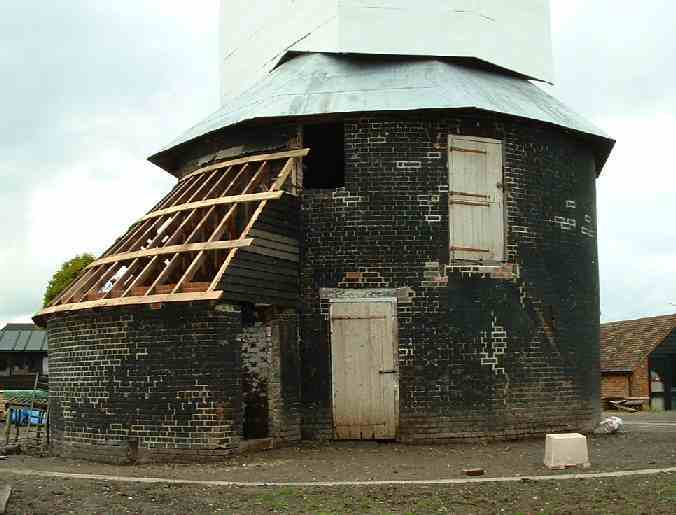 MONUMENT AT RISK - This is a picture of how bad the mill had become. The owners had no help from Wealden District Council, who were not at the time looking after a mill that they owned at Argos Hill. This council has no local list of buildings of historic interest and appears to rate the historic built environment very low in their agenda, though public borrowing and interest repayments are high - for which the local ratepayer is suffering. ELECTRICITY GENERATION - Just up the road from Windmill Hill heading west is the village of Herstmonceux. Before you enter the village proper on the A271, if you turn left at the triangle just before the speed restriction signs you will turn into Chapel Row. Chapel Row leads into Church Street, changing names at the junction where Lime Park is a turning on the right as you head towards Herstmonceux Castle. If you were to turn into Lime Park (you cannot because it is a private road) you would end up looking at the old generating station from C.1900. This is the view from Lime Cross, a field adjacent that adjoins with the A271 on the far side. The significance of the generating building is that the windmill at Windmill Hill produced flour for the local bakery and that later the same bakery used electric ovens to bake their bread, advertising this as a selling feature. This created what is now known as the Herstmonceux Triangle. There is a point in the adjacent field at the peak where you can see all three landmarks.